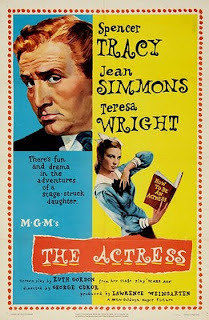 In MGM’s 1953 film The Actress, Jean Simmons plays the star-struck daughter of old salt Spencer Tracy. 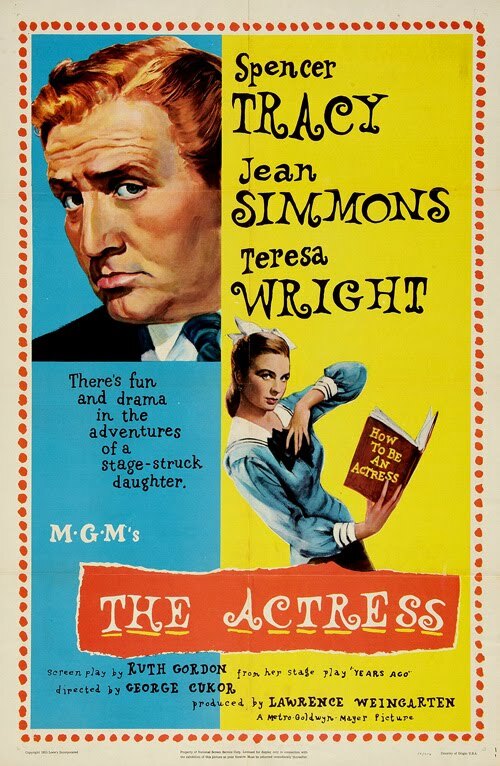 Simmons is enamored of a Bostonian stage actress and decides she wants to follow in the woman's footsteps. She writes a fan letter and receives an encouraging response, which convinces her she's destined to be a star. The arc of the film is concerned with the relationship of the father and daughter, as each tries to come to grips with the other’s dreams. Simmons’ youthful idealism runs smack into Tracy’s New England practicality and fatherly hopes. Of course money is an important part of the story, as there’s little to go around and Simmons needs to move to New York in order to take her shot. Things are complicated by Harvard nice-guy Anthony Perkins (in his screen debut) who is ready, willing and more than able to take Simmons off Tracy's hands. Set in the early 1910s (which isn't an era that I'm typically drawn to), I still found this to be an enjoyable film, primarily owing to the performances. Once acclimated to his somewhat affected characterization — feisty, talkative, irascible — Tracy dominates the film. Yet he somehow manages not to overshadow the other actors, and Simmons wisely downplays her performance in order to create functional screen chemistry between the two. Tracy's character softens over the course of the film — or rather becomes more human — so that by the end we see him less as a blowhard and more as a father who truly cares about his daughter’s dreams. One of the reasons Tracy's persona here is so unusual is that he had to find a way to differentiate his character from that of the warm and fuzzy dad in the Father of the Bride / Father’s Little Dividend films, which were his most recent hits at the time. The film primarily exists in the realm of drama, but there are a few funny moments, and one particularly comedic scene — in which Tracy and his pals put on a “gymnastics display.” It’s worth tracking The Actress down for this scene alone. As mentioned above, Anthony Perkins plays the fur-coat college boy who wants to marry Simmons, while her mother is played (surprisingly) by 34-year-old Teresa Wright, only a decade older than Simmons. Wright shines, as usual, but is almost unrecognizable as a middle-aged Massachusetts housewife. Look fast for Mary Wickes juggling bowling pins! Starring Specer Tracy, Jean Simmons and Teresa Wright. Availability: Warner Archive DVD here. If you’d like to contact me, please add me on Facebook through the link below—I had to remove my email address because of spam! I’m a college professor who loves movies — primarily noir, women’s pictures, musicals, screwball, and westerns. My favorite film is “The Best Years of Our Lives.” I’m also the author of “Film Noir 101: The 101 Best Film Noir Posters of the 1940s and 1950s” and “Take That, Adolf! The Fighting Comic Books of the Second World War,” both from Fantagraphics. Click the cover images below to find the books on Amazon.com. Finally, I’m obsessed with finishing lists of films, and watch hundreds of movies for the first time each year. I’m slavishly devoted to the Academy Awards. New Home - My writing – about music, not film, at the moment – can currently be found at my new blog: reddy brown objects.